This book was recommended to me by my friend, Dr. Myron Houghton and I was very glad that it was. 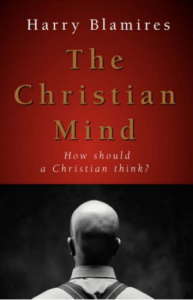 It is subtitled “How Should A Christian Think?” Blamires’ proposition is that “there is no longer a Christian mind.” Though he speaks of this generally, he is saying that Christians today (written in 1963) really have a secular mind but talk with Christian language. That is, we have been so inculcated by the culture of our day that, though we know biblical language, we think and act by non-biblical principles. Blamires includes polling, advertisement, administrative principles, worship methods and even loyalty as a virtue, “useful to give a bogus moral quality to a slavish acceptance of the party line.” In these and other ways he forcefully shows the pragmatic nature of Christian thinking today.